Iowa Democratic Party officials are poised to settle on Jan. 3 for their presidential caucuses, the same day Republicans will vote, a party official said Thursday. Party spokeswoman Carrie Giddins tells CBSNews.com that Democratic Chairman Scott Brennan will request a meeting of the State Central Committee by phone on Sunday evening and will recommend a move to the Jan. 3 date. The final decision will be made in a vote by approximately 50 members of the committee. Giddins told the Associated Press that Brennan is recommending the move to Jan. 3 after consulting with Gov. Chet Culver and Sen. Tom Harkin, the state's two top Democrats. Approval is considered a mere formality and would take one more step toward settling a campaign schedule that has been shifting for weeks. "It was a recommendation that was not come to lightly," Giddins said. Last week, Iowa Republican Party officials settled on the Jan. 3 date, and on Thursday they welcomed the Democrats' likely decision. Iowa GOP Chairman Ray Hoffmann said it was vital that the parties stick together to ensure the state could retain it's first-in-the-nation status in upcoming presidential election cycles. Arguing for that status would have been much more difficult if the parties had selected different caucus dates, he said. "On this one issue, we have to be together as we look forward to 2012," Hoffmann said. "If we separate on this issue, it will give other states a chance to move ahead of us." There had been speculation that the shifting calendar and rush by states to the start of the nominating season could prompt Iowa's caucuses to move into December, but Culver was adamant that they remain in 2008. Brad Anderson, the governor's spokesman, said Culver never changed his mind. "The governor has always said the caucuses should be first and in January," Anderson said. "He does not want to move them to December." Iowa initially was scheduled to hold its precinct caucuses on Jan. 14, followed eight days later by the New Hampshire primary, which that state's secretary of state had identified to the Democratic National Committee as tentatively scheduled for Jan. 22. That schedule was rocked as other states rushed to the front of the campaign season, with Florida setting a primary election on Jan. 29 and Michigan Republicans holding a primary on Jan. 15. Those moves prompted South Carolina officials to move up their primaries, leaving little doubt that New Hampshire would move as well. Many believe New Hampshire Secretary of State William Gardner will set that state's primary on Jan. 8, though he has not announced a decision. Gardner has said only that the New Hampshire primary would be no later than Jan. 8. He's not expected to announce a decision until November. Selection of caucus and primary dates have become part of a quadrennial competition for the attention both Iowa and New Hampshire receive as the first states in the presidential nominating season. Candidates of both parties descend on the states with huge campaign operations, drawing enormous media attention as well. All the major candidates have full-blown campaign operations in Iowa and New Hampshire, and most are spending heavily on advertising and organizing. 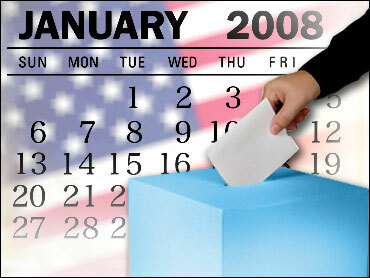 See the whole primary and caucus calendar here.